Perfect photo gift for any occasion - magnetic photo puzzles! A customized magnetic jigsaw puzzle is a sure way to spend some quality time with your family, and the addition of the customized picture will make the time more exciting and memorable. Our customized magnetic puzzles are made in such a way that will allow you children to stick the whole puzzle on your refrigerators or any other metallic surface. This way you can relish the moments on the puzzle every other day! 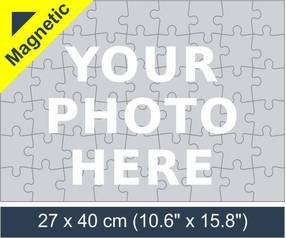 Create magnetic jigsaw puzzle by selecting jigsaw size and uploading a photo, design or artwork. Don’t Miss the Amazing Opportunity of Having Your Picture on Magnetic Puzzles! The concept of magnetized picture puzzle is a new one, but one that has been gaining popularity with each passing moment. The puzzle in question is just like a normal photo jigsaw but with the cool addition of magnet at the back of it so you could stick it on any metallic surface. We have the capability of turning your amazing pictures into a magnetic picture puzzle. Additionally, you have the full control on the sizes as well, as you can select any size from the six sizes that we offer. Our customized magnetic picture puzzles is a thoughtful gift which makes you witness your children’s smile as they have the capability of striking greater interest than the standard ones. No matter how hard the times are on you, a simple and quick look will awaken all the memories associated with the customized magnetic photo jigsaws on your refrigerator. Moreover, the memorable picture on it will make you think of all the good times. Magnetic Jigsaw Puzzle Calls for Photo Selection by You! Magnetic jigsaw puzzles can be a great gift, and no matter how hard the receiver is to impress, their hearts will surely melt away with a single glance at the customized magnetic jigsaw puzzles.